“Just-in-time” delivery has become an ideal for many industries looking to optimize their efficiency and responsiveness. For the power sector, though, it’s been the business model for well over a century—and that’s the problem. Apples and Oranges. Energy storage facilities are unfortunately not always described consistently in media reports and press releases (or even government data), being typically rated in terms of power capacity (watts) and only sometimes in storage capacity (watt-hours). The approach in this article is to report both figures where available, because two “2-MW” projects may have very different performance characteristics despite having the same rated power. The distinction is important because some technologies (such as flywheels) have high power but low energy, while others (flow batteries) may be low power but high energy, and still others (pumped storage hydro and compressed air) have power and energy capacities that are determined by their associated power plants and volume of available physical storage, values that unlike other storage technologies are generally not interdependent. Storing energy on the grid is not a new idea, and a number of major storage projects have been operating since the 1970s. Virtually all of these, however, are pumped storage hydroelectric (PSH) plants. Of the 21.1 GW of total energy storage capacity in the U.S., more than 96% is PSH. Another method, compressed air energy storage (CAES), has been in use since the 1990s, though worldwide only two large-scale CAES projects are currently in operation. According to the International Energy Agency, of the approximately 140 GW of large-scale storage in global operation, more than 99% is PSH. Nearly 50% of the remainder is accounted for by the two CAES plants. PSH and CAES, however, have geographic limitations in that they can only be sited in areas where storage of large volumes of water or air is feasible, not where they might be most useful for the grid. In addition, both methods, though well-suited for hours-to-days storage, cannot ramp fast enough to respond effectively to more immediate demands, such as for frequency regulation. More nimble methods that can be sited in areas of highest need have been handicapped by limited capacities and high costs. However, 2014 may be remembered as the year that began to change. A report in January from IHS predicted that the energy storage market was about to “explode,” adding 6 GW in 2017 and 40 GW by 2022, with about 40% of this growth occurring in the U.S. While total capacities are currently small, events suggest energy storage is building momentum toward becoming a key element of the grid. Perhaps the single most significant development driving attention to energy storage, according to Matt Roberts, executive director of the Energy Storage Association, has been the increased penetration of intermittent renewable generation. “Adding storage is a way to help with intermittency and peak load aspects,” he told POWER in March. This has meant increased demand for methods to smooth output and respond to sudden drops in production. Not surprisingly, most of the policy activity has been in areas with substantial recent additions to renewable capacity (Figure 1). California. In 2010, California passed legislation instructing the California Public Utilities Commission (CPUC) to consider requiring the state’s service providers to procure certain levels of energy storage. 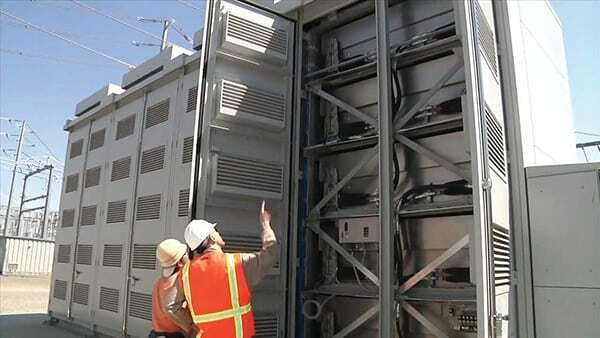 Last year, the CPUC issued a requirement for the state’s investor-owned utilities, Southern California Edison, San Diego Gas & Electric, and Pacific Gas & Electric (PG&E), to collectively obtain 1.3 GW of energy storage by 2020. The targets are broken down into transmission, distribution, and customer storage, and will be phased in over two-year periods starting this year. No more than 50% can be owned by the utilities, and PSH is excluded from the mandate. Certain existing projects can count toward the total, and the program is designed to encourage a range of ownership models. Coming up with a process for procurement required some new thinking. The CPUC recognized that the existing auction process under the state’s renewable portfolio standard wouldn’t work for energy storage, which isn’t simply a block of generation but rather a range of roles and services that cut across most grid functions. Instead, the utilities are to issue “requests for offers” (RFOs) that will meet defined needs. Other electricity service providers have their own marching orders. Entities other than municipal utilities must procure storage equal to 1% of their annual peak load by 2020. Municipal utilities do not have fixed targets but must instead conduct assessments, come up with their own plans for obtaining storage, and submit them for approval by the California Energy Commission by October 2014. The targets, though ambitious, are somewhat fluid. In the event the RFOs don’t produce bids that meet identified needs, the utilities are allowed to defer up to 80% of their targets to the next phase. The utilities are also allowed to shift targets between categories to some extent. New York. This state has long suffered from significant load congestion around New York City, where the majority of its population lives. Most of the city’s power is generated elsewhere and transmitted through a few narrow corridors. This congestion naturally causes frequent spikes in wholesale power prices. Another key concern is the potential closure of the Indian Point nuclear plant—the Nuclear Regulatory Commission has yet to rule on a license extension, and state politicians have called for its retirement—which supplies about 25% of the city’s power. In January, the state government announced a program with Consolidated Edison (ConEd) intended to reduce the load on the area grid by 125 MW, in part through energy storage. The proposed program includes generous subsidies for storage projects: up to $2,100/kW for battery storage and $2,600/kW for thermal storage, with added incentives for large-scale (greater than 500 kW) facilities. The state is also investing in a battery storage testing and commercialization center in Rochester, a $23 million partnership between the New York Battery and Energy Storage Technology Consortium and DNV KEMA (now DNV GL). 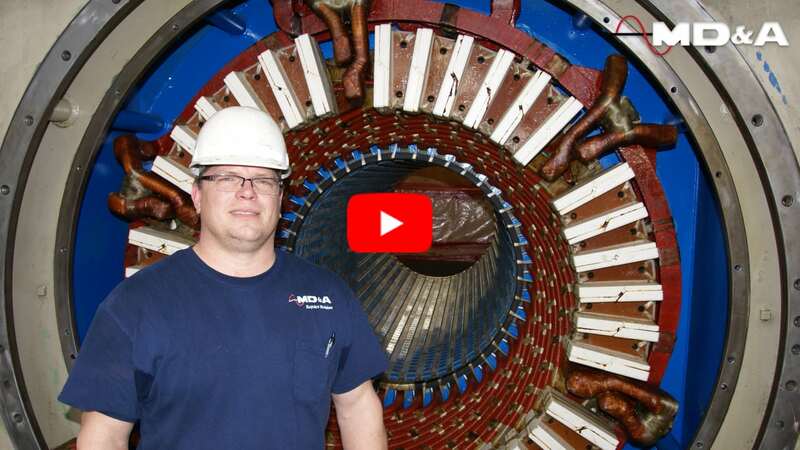 The New York Independent System Operator (NYISO) has the distinction of having the first large-scale flywheel-based frequency regulation plant in the country, a 20-MW/5-MWh facility operated by Beacon Power. Beacon Power struggled financially when the plant was opened in 2011, but changes in compensation for frequency regulation (see below) have placed the company on a more stable footing. FERC and the ISOs. The Federal Energy Regulatory Commission (FERC) has issued several orders intended to improve market access for energy storage. FERC Orders 890 in 2007 and 719 in 2008 directed the nation’s independent system operators (ISOs) to revise their regulations and operating procedures to allow energy storage to participate in wholesale energy markets. These were followed by Orders 755 and 784 in 2011 and 2013, respectively, that required ISOs to adopt methods allowing compensation for frequency regulation and other ancillary services, roles that newer energy storage technologies are well-suited to adopt. Previous rules had handicapped third-party ancillary services because there was no financial benefit for a transmission customer to go outside the services offered by its transmission provider, a share of which it was required to pay for anyway. Most recently, in November 2013, FERC issued Order 792, which adds energy storage to the category of resources eligible to connect to grid under the Small Generator Interconnection Procedures. PJM was the first ISO to adopt Order 755, followed by NYISO, which was the first to adopt 784. (The others have followed suit, with ISO-New England most recently adopting Order 755 this year.) PJM’s Advanced Technology Pilot program has explored a number of options for storage within its territory, and PJM has partnered with AES on two battery projects, one of them a 32-MW/8-MWh facility at a wind farm in West Virginia. AES and PJM also launched an initiative known as the Storage Applications Center at the PJM campus in Pennsylvania in March (see below). PJM has also been studying the feasibility of using electric vehicle batteries for frequency regulation in a project with NRG Energy and the University of Delaware. The Electricity Reliability Council of Texas (ERCOT), while not under FERC jurisdiction, is studying similar steps to make its market more storage friendly. A law passed in 2011 gave energy storage the same rights of interconnection and transmission as generators. Though a possible shift toward a capacity market has grabbed the headlines, ERCOT is also looking at revisions to ancillary services rules. A pilot project using advanced lead-acid batteries has been operating at Duke Energy Renewables’ 153-MW Notree wind farm near Odessa. ERCOT has also been testing a fleet of 12 truck-mounted batteries to provide mobile frequency regulation services. Island Time. Solar energy has been a boon for island grids that must rely on expensive imported diesel and fuel oil. But the growth of residential and commercial solar in places like Hawaii and Puerto Rico has challenged grid operators to maintain stability during periods of peak daytime output. Late last year, the Puerto Rico Electric Power Authority and the island’s main utility, the Autoridad de Energía Eléctrica, issued new guidelines for renewable energy projects that want to connect to the island grid. All new projects must include energy storage equal to 45% of maximum output for 1 minute in order to smooth output and reduce the severity of ramping events. In addition, projects must have storage equal to 30% of rated capacity for 10 minutes for purposes of frequency regulation. This approach has garnered attention for its focus on installed capacity rather than performance. Whereas storage projects bidding into markets such as PJM could face penalties for failing to perform, such a scheme was seen as a deterrent on the island’s much smaller grid. Hawaii now requires new wind projects to limit their ramp rates, which as a practical matter is only possible through energy storage. 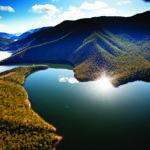 The state government has launched several partnerships and initiatives to study the best means of integrating storage into the power mix and find ways for reducing costs. Japan. The success of Japan’s ambitious feed-in tariffs in spurring development of renewable energy—it installed a breathtaking 9.4 GW of solar photovoltaic generation in 2013—has created a sudden need for energy storage, and the national government is moving aggressively to support it. The Ministry of Economy, Trade and Industry (METI) has allocated about $300 million for energy storage projects, among them the world’s largest redox flow battery in Hokkaido. The 15-MW/60-MWh facility, due to come into service in 2015, will support the massive build-out of solar in Hokkaido that has threatened to overwhelm the island’s grid. (See “Japan Ramps Up Renewables” in the February 2014 issue.) METI is supporting several other smaller battery projects elsewhere in the country, including through a $100 million subsidy program for individuals and small businesses announced in March. Japan is a world leader in sodium-sulfur (NaS) battery technology thanks to intense research and development, mainly by NGK. It currently has more than 190 NaS installations across the country with a total of 270 MW/1,640 MWh of installed capacity. 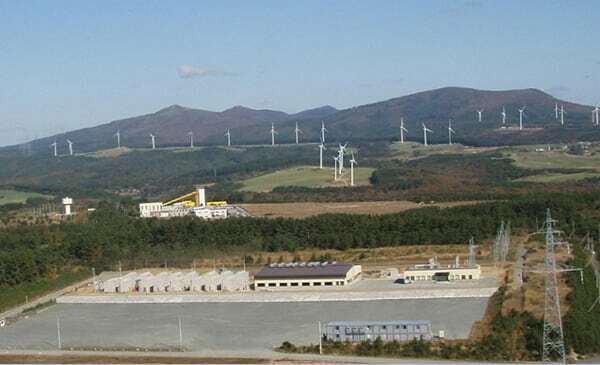 The largest installation is a 34-MW/245-MWh facility backing up the 51-MW Rokkasho-Futamata Wind Farm in northern Aomori Prefecture (Figure 2). 2. Big backup. This wind farm in northern Japan incorporates one of the largest battery-based energy storage systems in operation worldwide. The 51-MW facility includes 245 MWh of sodium-sulfur battery storage. Courtesy: Japan Wind Development Co.
Germany. With the world’s largest installed capacity of renewable generation, Germany has not been idle on the energy storage front. The federal government has allocated $260 million for support of grid-scale energy storage, of which $172 million has been apportioned to specific projects. In 2011, the government revised regulations governing energy storage to clarify grid fee exemptions for such projects and improve the policy support for storage investment. In 2013, it also began offering €25 million in homeowner subsidies for energy storage. The program is aimed mainly at rooftop solar and covers up to 30% of the installed cost of a storage system when paired with solar panels. Germany is also looking into power-to-gas (P2G). In August 2013, E.ON inaugurated a 2-MW/30-MWh facility in Falkenhagen that generates methane via electrolysis and methanization with CO2, and uses it to generate electricity via fuel cells. In October, a second P2G facility was added to a wind farm in Grapzow; that plant has a capacity of 1 MW/27 MWh. Both projects were built by Canadian firm Hydrogenics. A third P2G facility near Hamburg, also for E.ON, is under development. A great deal of activity is afoot in the battery industry, from evolution of existing designs and improvements in manufacturing to new technologies. 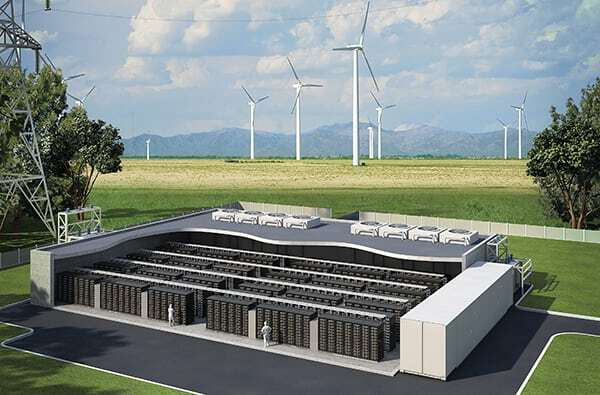 Navigant Research estimates that the global market for utility-scale storage batteries will grow from $164 million this year to more than $2.5 billion by 2023. Lithium-ion (Li-ion) batteries have reached grid-scale commercial viability for certain applications, with several manufacturers moving beyond merely selling batteries to offering integrated storage-related services. In March, AES subsidiary AES Energy Storage introduced its Advancion solution comprising containerized Li-ion batteries, a proprietary hardware and software management platform, turnkey installation, and full operations and maintenance support. The system is available in 2-MW to 50-MW units and is scalable into the hundreds of megawatts. 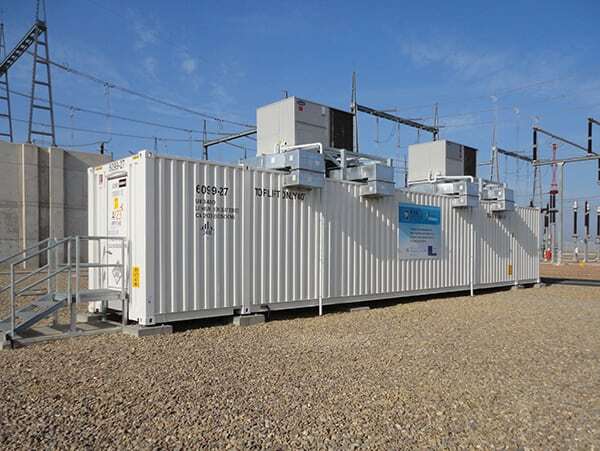 French battery giant Saft has been developing similar containerized solutions, built around its modular Intensium Max units, which offer rated power ranging from 500 kW to 1.6 MW, and storage from 420 kWh to 1 MWh. A123 Energy Solutions’ Grid Battery System, which powers several current AES Energy projects, offers both long-duration and high power options, ranging from 2 MW/575 kWh to 4 MW/4 MWh (Figure 3). Hybrid battery projects, which leverage the advantages of different battery technologies to create a more flexible overall product, are also gaining momentum. E.ON, battery manufacturers Exide and Beta Motion, and SMA Solar Technology announced in February that they were joining forces to develop a 5-MW modular battery system, named M5BAT, at Aachen in Germany. The design will combine Li-ion, lead-acid, and sodium–nickel chloride batteries into a single unit capable of meeting short-to-medium-term demands. Construction is set to begin this year and be completed in 2015. The project is being supported by €6.5 million from the Ministry for Economic Affairs and Energy. The growth in demand for Li-ion batteries is driving new partnerships and initiatives, several of which are kicking off this year. In March, Siemens and engineering firm M+W Group announced plans for a joint venture aimed at advancing production technology for battery manufacturing and developing a complete control technology solution for the mass production of large-size batteries. Also in March, A123 Systems’ Energy Solutions business unit was purchased by Japan’s NEC, which plans to create a new division focused on storage, NEC Energy Solutions. The new operation, slated to open its doors in June, will combine NEC’s information and communications technology with A123 Energy’s storage systems to offer complete turnkey storage solutions. The biggest news in manufacturing, however, is automotive firm Tesla’s plans for what it calls a “gigafactory”—not just the largest battery factory in the world but one with an output that, at 35 GW per year, would exceed the total worldwide production of Li-ion batteries in 2013. The $4 billion to $5 billion project is currently in development, but construction is slated to begin later this year. Though mainly intended to supply Tesla’s fleet of electric vehicles, the factory is also specifically aimed at meeting storage needs of the renewable energy market. Analysts expect that, if successful, the factory could significantly drive down the cost of Li-ion batteries, possibly under $150/kWh. Currently, Tesla pays around $200/kWh to $300/kWh. Several new battery technologies are nearing commercialization this year. Eos Energy Storage worked with ConEd in New York City last year to test a 5-kW/30-kWh version of its zinc-air battery technology. Eos reportedly has a 1-MW/6-MWh version, called Aurora, due for deployment this year, and it claims its batteries will be cheaper than other technologies, at about $160/kWh. However, the design has a reported 75% round-trip efficiency, which is significantly lower than other options (Li-ion batteries typically see efficiencies around 95%). In March, Eos received a $1 million grant from the New York State Energy Research and Development Authority to help develop its technology. Primus Power has developed a zinc bromine hybrid redox flow battery that it is rolling out this year at sites in Washington and San Diego. Like other designs, the system is containerized and can be installed in 250-kW/750-kWh units, which it calls EnergyPods (Figure 4). Primus has a grant from the DOE to install a 25-MW/75-MWh system for the Modesto Irrigation District in California; work on that project is expected to begin in 2015. Axion Power is introducing an advanced lead-acid battery in which the negative electrode is replaced by a supercapacitor made of activated carbon. This gives its patented “PbC” battery much faster recharge rates and approximately five times the cycle life of a traditional lead-acid battery. For grid applications, the PbC batteries are mounted into a PowerCube module, a mobile container with up to 1-MW/500-kWh storage capacity. Two pilot projects are in operation, and a 500-kW project attached to a solar plant in New Jersey is under construction with a target completion date later this year. After decades of stagnancy, in which only two commercial plants were constructed—and none brought online since 1991—there are signs that CAES may finally be poised to grow. Much of this is being driven by advances in technology and developments in next-generation CAES that is not dependent on geographical limitations. A report from Navigant Research released in August 2013 predicted that 11 GW of new CAES capacity would be added worldwide by 2023. In July 2013, Apex Compressed Air Energy Storage and Dresser-Rand announced that they would partner to build a 317-MW CAES plant in Anderson County, Texas (roughly between Dallas and Houston). The project will use the Bethel salt dome, which has previously been used for natural gas storage, to store the compressed air. Permitting and financing is currently under way, and Apex hopes to break ground this year with completion targeted for 2017. The $200 million project, which is potentially expandable to 476 MW, will sell energy into the ERCOT market. PG&E has been exploring a CAES plant of its own to be built somewhere in the California Central Valley. The PG&E plant will use porous rock formations. The project has received funding from the DOE and CPUC and has a goal of 300 MW rated power and 3 GWh storage. Meanwhile, the Bonneville Power Administration (BPA) has been looking at CAES as a means of dealing with its regular oversupply issues. BPA has been working with the DOE’s Pacific Northwest National Laboratory to identify sites, also in porous rock, for CAES plants. Two possibilities in eastern Washington were identified last May. While the Bethel and PG&E projects will employ conventional CAES technology, another project has the potential to greatly expand the reach of CAES, though into a different niche. New Hampshire–based SustainX has developed the first MW-scale isothermal CAES (ICAES) system (see “First Megawatt-Scale Isothermal CAES Completion” in the November 2013 issue). Unlike conventional CAES, the heat from the compression process is captured and stored using a two-stage aqueous foam–based system using pneumatic cylinders. Because the system does not rely on geological storage, it can be sited anywhere. Though its storage capacity is much smaller than that of conventional CAES—the first ICAES project in New Hampshire is rated at 1.5 MW/1.5 MWh—it is far more efficient. SustainX claims a round-trip efficiency of better than 95%, compared with around 40% to 50% for conventional CAES. Another project under development by German energy giant RWE and General Electric (GE) represents a more incremental advance in CAES by making the process adiabatic—that is, transferring the heat to a storage reservoir as compared with storing it in the same system, as with ICAES. The ADELE project in Stassfurt, Germany, currently in a one-year pilot phase, will pass compressed air through 40-meter-tall containers of ceramic brick to capture heat energy and then return it during expansion. Power will be generated using an air turbine rather than natural gas. The goal is a 90-MW/360-MWh demonstration plant that will operate at around 70% efficiency and store output from area wind farms without CO2 emissions. If all goes well, operation could commence in 2016. Though CAES is theoretically a worthwhile add-on to gas turbine plants, its geographical limitations have prevented wide-scale applications. Liquid air energy storage (LAES), however, has the potential to remove that limitation. 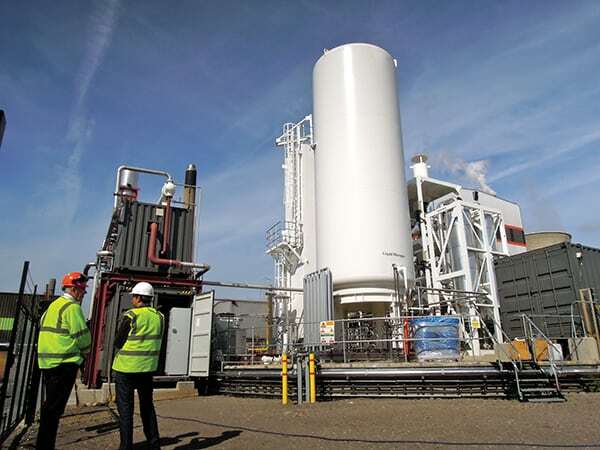 UK-based Highview has been developing LAES technology for several years and has been operating a 350-kW/2.5-MWh pilot project adjacent to SSE’s 80-MW Slough biomass plant near London since 2011 (Figure 5). In February, the UK Department of Energy & Climate Change awarded Highview and Viridor more than£8 million to build a new 5-MW/15-MWh LAES demonstration project at a Viridor landfill-gas power plant. 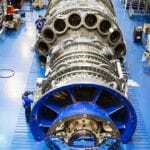 The following month, Highview and GE announced a partnership to explore opportunities for adding LAES technology to gas turbine peaker plants using GE turbines. 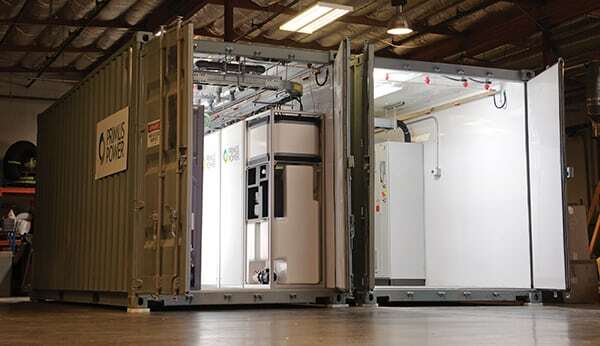 GE believes LAES has the potential to improve start-up times, efficiencies, and heat rates in addition to adding energy storage to allow time-shifting and increased plant flexibility. Highview says its LAES method is potentially scalable to more than 50 MW. Beacon Power is finishing construction of its second flywheel facility in Hazle Township, Penn. The plant began commercial operation in September 2013 when the first 4 MW of flywheel storage came online. The remaining 16 MW of capacity have been added progressively since then. Like its plant in New York, the Hazle Township facility provides frequency regulation services, in this case into the PJM market. One of the most unusual storage projects currently under way—though one with intriguing potential given its remarkable simplicity—might be likened to dry PSH. 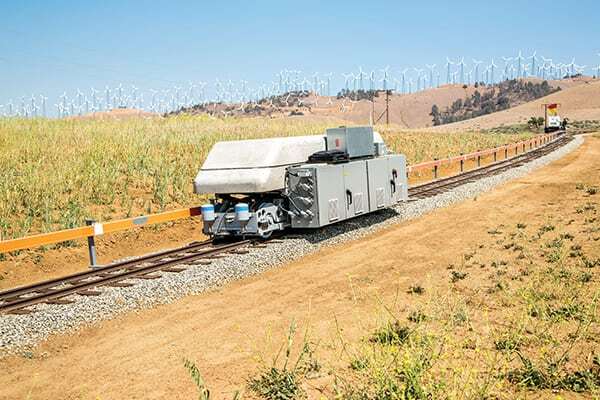 Santa Barbara, Calif.–based Advanced Rail Energy Storage (ARES) is building a 50-MW, 12.5-MWh storage system in Nevada that uses nothing more high tech than rail cars filled with cement. The cars are driven to the top of a hill by electric motors, and when power is needed, they’re rolled back down the track, running their motors in reverse to generate electricity (Figure 6). The $40 million system is being built as a merchant plant but will connect to Valley Electric, a local electric cooperative with connections to the California ISO. The goal is to get online by 2016 in hopes of serving the California storage mandate. Assuming sufficient space is available, ARES believes its system could be scaled up to as much as 3 GW capacity and 24 GWh of storage, at up to 80% round-trip efficiency. As the energy storage industry matures, business models are maturing with it. 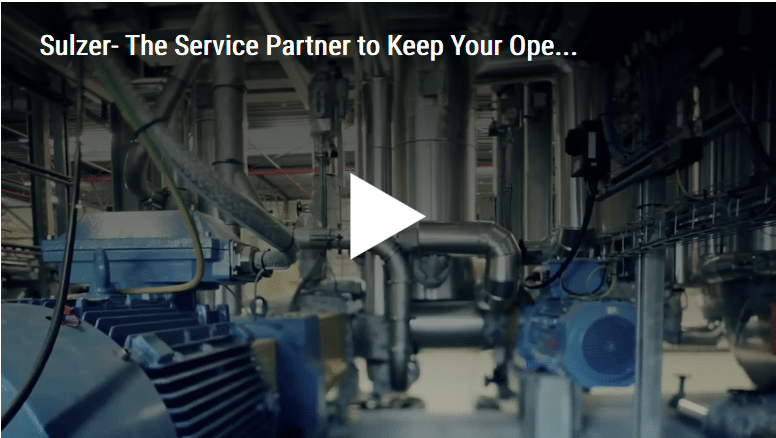 A number of companies are introducing services intended to support energy storage solutions independent of the products or technology being used. In March, AES announced that it was launching a new initiative called the Storage Applications Center. The project is designed to serve as a test bed for new storage technologies and applications in partnership with PJM. According to Shelton, the center will help refine applications for battery-based services such as dynamic voltage support, peaking capacity, real-time autonomous dispatch, faster regulation, and protocols for merit order dispatch. AES also recently launched its Battery Integration Center in Indianapolis, which is designed to work with battery and power conversion manufacturers in developing products for AES’s Advancion solution. “We found it was better for us to procure components from [these suppliers] and wrap it all together with our control system and make a finished solution.” The project is “technology agnostic,” he said—while currently focused on Li-ion batteries, AES is also looking at other technologies. Several companies have introduced storage management software intended to standardize how storage projects—mainly batteries—operate and connect to the grid. While battery manufacturers typically offer their own software, the intent is to make it possible for customers to break free from proprietary solutions. Maryland-based Greensmith has offered its GEMS platform for battery management since 2008 and will deploy 23 MW of storage projects in 2014. Seattle-based 1Energy Systems and San Francisco–based GELI are also pushing their own solutions. 1Energy is currently partnering with the Snohomish County Public Utility District, Alstom Grid, and Parker Hannifin on a 1-MW pilot project in Washington. Stem, based in Millbrae, Calif., though it also offers a software product, is taking a different tack—one modeled after third-party ownership for rooftop solar photovoltaics. Stem has raised $5 million to offer energy storage as a contract service for entities that can take advantage of energy storage but that don’t want to commit to the large up-front costs. Under Stem’s approach, it will own the batteries and contract to provide storage services over a set period, typically 10 years. Stem currently has contracts for 6 MWh of storage, though only about 100 kWh has been installed so far. A number of other methods have drawn interest as a means of grid storage but are not yet commercial. These include new technologies such as supercapacitors and hybrid supercapacitor-flow batteries, as well as new uses for existing technologies, such as repurposing used electric vehicle batteries (the latter idea is being tested by Sumitomo in Japan). Much attention is likely to be devoted to California’s experiences with its storage mandate and whether this is successful in economically adding capacity to the grid and nurturing the still-nascent industry. In that, Roberts said, “We’re going to see different types of energy storage systems deployed for different uses,” which will increase visibility for the various roles storage can play.